Show your aviation lineage with the legendary VS-35 Blue Wolves on a 14 inch solid wood plaque. Each piece is carefully carved and hand painted to provide a colorful piece of craftsmenship you’ll love! With improved electronic support measures equipment, the Harpoon anti-ship missile, and the most advanced airborne imaging radar in the fleet, the Blue Wolves and the S-3B, have evolved as a formidable sea strike asset that will lead the carrier air wing and the battle group into the 21st Century. The Operations Department is responsible for planning, coordinating, and scheduling the operations of the Squadron and all it’s assigned aircraft. 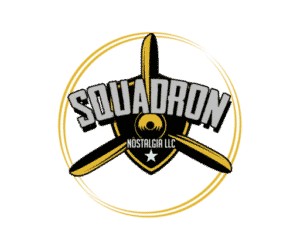 The Administration Department is responsible for the maintenance of officer and enlisted personnel records, administration, the accountability of Squadron correspondence and the legal and public affairs of all squadron members. The Maintenance Department is responsible for the effective and efficient repair and upkeep of all squadron aircraft in order to maintain maximum readiness. The Safety Department coordinates the squadron safety program which is responsible for the protection of all squadron assets concerning aviation, maintenance, motor vehicles, and flight crew training and evaluation records. 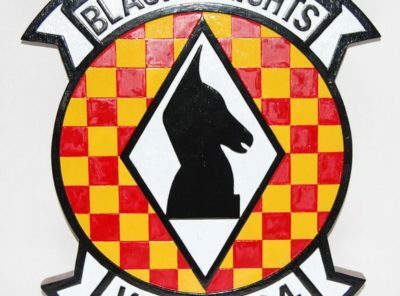 The Tactics and Training Departments are responsible for developing and implementing the squadron’s turn-around training plan and continuing the development of tactical innovations. The Training Department works closely with each of the other Departments to ensure scheduled training is conducted and when needed, school quotas are obtained and orders are provided. 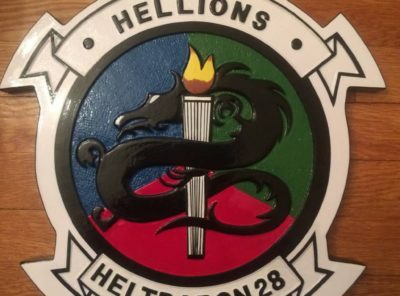 The Tactics Department supports squadron tactical readiness by developing and maintaining the squadron shore- based training plans; conducting both periodic and event-specific tactical training; developing and analyzing new tactics; planning and analyzing air wing, battle group, and other exercises; and encouraging and assisting in the submission of new tactics and concepts. Commissioned on 03 January 1961, the “Boomerangs” of VS-35 operated eleven S2F-1 aircraft while awaiting introduction of the new S2F-3 Tracker. By June 1961, VS-35 received it’s first S2F-3 at NAS North Island and the fledgling squadron saw its first deployment the following year on board the USS HORNET (CVS-12). In 1963, VS-35 deployed for a second time on board HORNET and won the ASW “A” and the Air Operations “E” awards for performance excellence. VS-35’s third deployment was unique. For the first time in its history, the squadron participated in combat operations. This was in the Gulf of Tonkin. Flying with and without fighter protection, squadron aircraft maintained constant surface and subsurface surveillance in support of Vietnam operations. 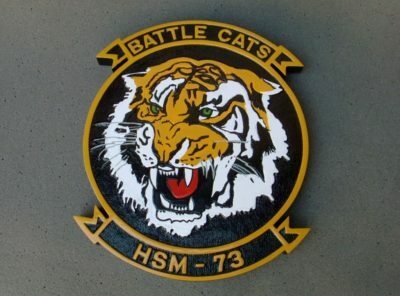 For these efforts, VS-35 received its first battle ribbon in March 1966. Flying the S2-D, VS-35’s fourth deployment in March 1967 thoroughly tested the Tracker’s all-weather capability while transiting the Sea of Japan. 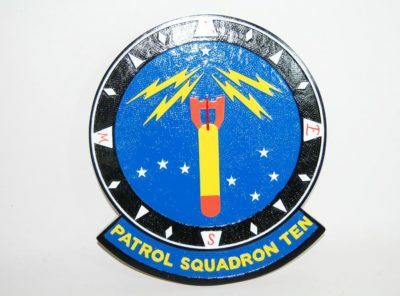 By the summer of 1969, the squadron had received its third consecutive CNO safety award and proudly displayed the Safety “S” with two hash marks. After their fifth deployment to the Pacific in September 1968, the squadron became a part of Carrier Anti-Submarine Air Group FIFTY-THREE. On 17 May 1972, VS-35 deployed to the Pacific aboard the USS TICONDEROGA (CVS-14) and, along with Air Group FIFTY-THREE, participated in the mining of Haiphong Harbor in North Vietnam. The Squadron received its disestablishment orders in June 1973. Between October of 1976 and May of 1988, preparations to re-establish VS-35 flying the new S-3A Viking aircraft were terminated for fiscal constraints. 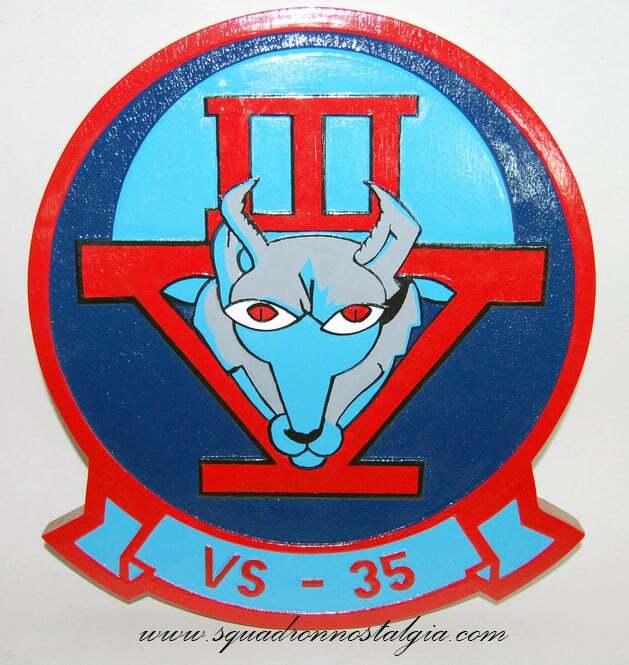 The rebirth of VS-35 officially began on 03 October 1990 when Commander D.G. Heine assumed the duties of Officer-In-Charge. Official re-establishment occurred on 04 April 1991. VS-35, flying the S-3A, became part of Carrier Air Wing FOURTEEN (CVW-14) attached on the USS CARL VINSON(CVN-70)on 10 October 1991. The transition to the S-3B in December of 1992 further expanded VS-35’s role within the Battle Group as the technologically advanced Viking became the premier platform in war-at-sea scenarios. On 17 February 1994, the “Blue Wolves” deployed on the USS CARL VINSON, marking their first deployment since 1972. VS-35 remains a part of Carrier Air Wing FOURTEEN, but is now attached to the USS ABRAHAM LINCOLN (CVN-72) Battle Group which deployed in June 1998 and recently returned in December 1998 from the Western Pacific and the Arabian Gulf where the squadron flew in support of OPERATION SOUTHERN WATCH. This deployment proved highly successful for VS-35 with the command being awarded its second consecutive SEACONWINGPAC Commodore’s Cup for weapon’s excellence, the Arnold J. Isbell Trophy for ASW excellence, the SEACONWINGPAC Golden Wrench award, the CVW-14 and CINCPACFLT Golden Anchor awards, and the 1998 COMNAVAIRPAC Battle Efficiency (Battle “E”) award. During two arduous work-up periods and WESTPAC deployment in 1998, VS-35 flew more than 2700 sea-based hours and accumulated over 1230 arrested landings. 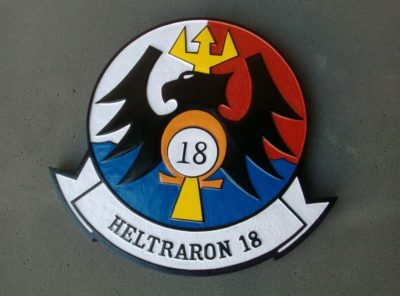 In the post deployment months of 1999, the Blue Wolves’ continued to display their exceptional level of operational expertise during several combined exercises including the 1999 CVW-14 Tactical Exercise, a close air support (CAS) exercise in Twenty Nine Palms and an experimental AGM-84A Harpoon shoot at NAS Point Magu. 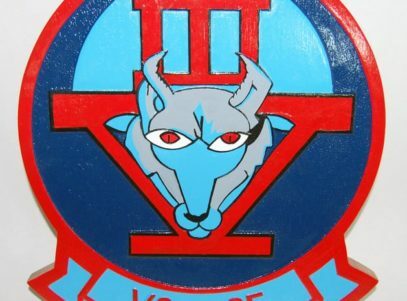 In October of 1999, the Blue Wolves won their third consecutive SEACONWINGPAC Commodore’s Cup, a feat never achieved any West Coast Viking squadron. Since initial establishment, VS-35 has accumulated over 80,000 hours and over 18,000 carrier landings, accident free. 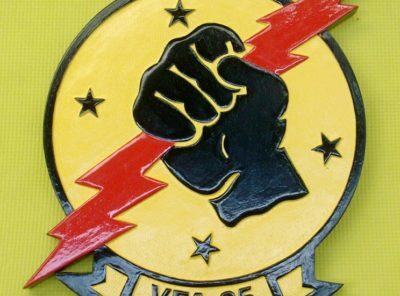 VS-35 was disestablished March 31, 2005.